In a large pot of boiling salted water, cook spaghetti pasta until al dente. Drain well. Toss with 1 tablespoon of olive oil, and set aside. Meanwhile in a large skillet heat 1 tablespoon olive oil. Add chopped onion, and cook over medium heat until onion is translucent. Add minced garlic, and cook 1 minute more. Add wine if desired; cook one more minute. 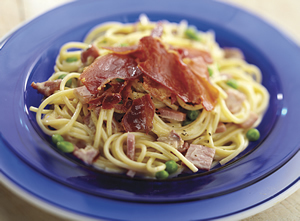 Add chopped ham to pan; add cooked and drained spaghetti. Toss to coat and heat through, adding more olive oil if it seems dry or is sticking together. Add beaten eggs and cook, tossing constantly with tongs or large fork until eggs are barely set. Quickly add 1/2 cup Parmesan cheese, and toss again. Add salt and pepper to taste (remember that bacon and Parmesan are very salty). 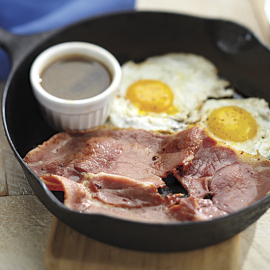 In a separate skillet crisp the thin ham slices in a tablespoon of olive oil. 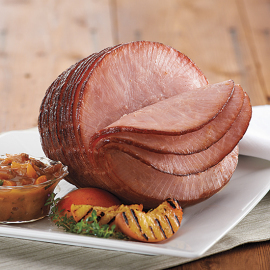 Serve immediately with ham slices on top, and extra Parmesan cheese at table.